WOU welcomed SPM school leavers to its newly introduced full-time Diploma in Business Management (DBM) programme during the inaugural March 2019 intake. In his opening remarks at the orientation held at the main campus today, Chief Operating Officer/Registrar Yeong Sik Kheong motivated the students to set their vision higher, using their Diploma as a stepping stone towards obtaining a degree and other achievements. Yeong tells the students to value their learning experience at WOU. He reminded them that though the university environment is different from a school setting, they are expected to always respect the lecturers, administrators and the other staff of WOU. He also requested that they converse in English in the classroom and among themselves, declaring that it is rude to speak in dialects in mixed company. He advised the new students to freely explore and ask questions, and to hone their soft skills for more effective learning. “You can gather the technical knowledge from the Internet but the interaction, communication, development of soft skills, finding out facts by yourself, doing research, learning how to get along, will make you stand out and prepare you for the future,” stressed Yeong. WOU Bursary Award recipients Nur Syaza and Clarissa (2nd and 3rd from right). He later presented the WOU Bursary Award to two freshmen, Clarissa Koh and Nur Syaza Erina Muhammad Rafie, who enrolled with excellent SPM results, and informed all the new students that they can apply for the Merit Scholarship every semester if they do well. 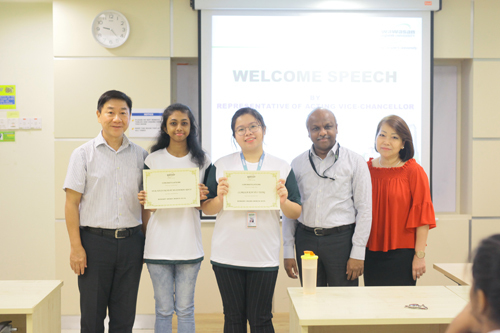 Earlier, Penang Regional Centre (PGRC) marketing & admissions officer Sasikanth Mariappan welcomed the new students while PGRC director Ching Huey Ling introduced her team. Ching introduces her team. At right is Sasikanth. Freshman Karishma Abdullah, 19, from Convent Light Street, then led the new students in the oath-taking ceremony. 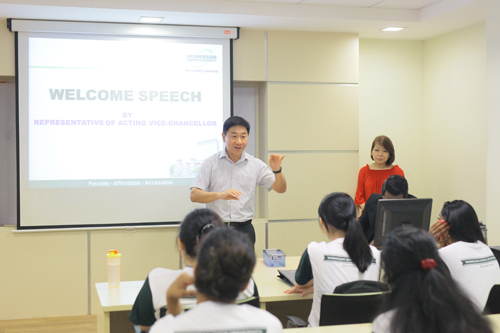 Among those who attended the orientation were School of Business & Administration Acting Dean Prakash Arumugam, full-time programme coordinator Lilian Yap, and the academics. Karishma leads in reciting the students’pledge. “My cousin brother introduced me to WOU. He is pursuing a part-time business degree programme here. He told me about a new diploma programme at WOU since I was looking to study diploma. I came to inquire and straight away registered because I like the programme structure. I just have to take three subjects in the first semester, I can concentrate better. His father has retired from working as a production worker and his mother is a school laboratory assistant. He is an only child. For achieving 9 As in SPM, she received the WOU Bursary Award of 100% off in total tuition fees. She often passes by the main campus, and so is quite familiar with WOU. Her parents visited PGRC to inquire when they were in the vicinity and learnt about the new Diploma programme. They recommended her to enrol. 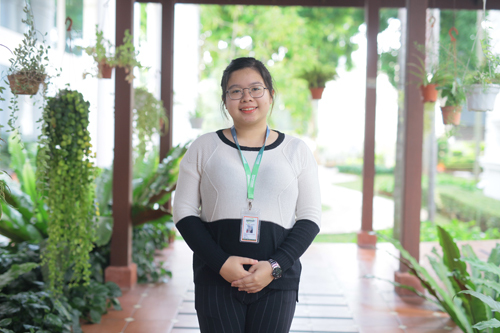 “I chose WOU as it is in Penang, so close to home, and affordable. I want a career in investment or business. After my diploma, I will likely continue with a degree here. Her father works as a Human Resources Director in Singapore, and her mother is a homemaker. She has an older brother pursuing his degree at UTAR, Kampar. She was rewarded with the WOU Bursary Award of 50% off on tuition fees for her 8 As in SPM. “I prefer to do Diploma than STPM as I feel it would be easier for me. I enrolled at WOU, mainly because of the reasonable price and I can afford it. I did compare with a few colleges in Penang and found WOU to be cheaper. I also like the atmosphere here. “I find business management to be an interesting field. I hope to learn how to manage a business, financial-wise, and the people. The lecturers are all very nice and everything is good. Her father works as an Assistant Manager in a freight forwarding company in Penang and her mum is a homemaker. She has three younger brothers in school.